Free water provided by kindly citizens has lessened the adverse effects of the swelteringly hot weather. Cyclo drivers, manual laborers, lottery ticket vendors have been enjoying the fresh cool water provided by Nguyen Thi Huong, in front of her house at 63 Dien Bien Phu Street in District 1. 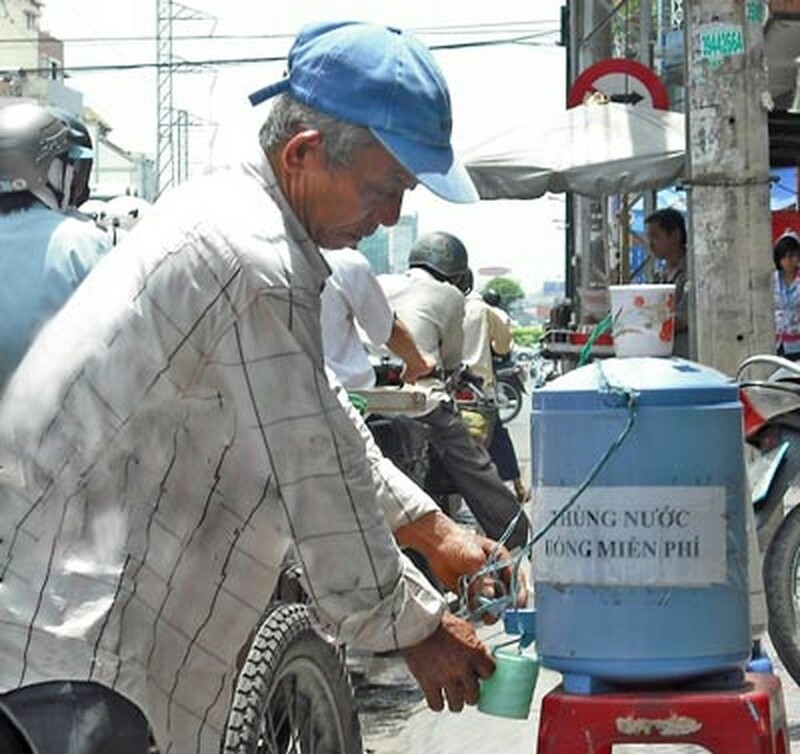 Huong has offered free casks of drinking water to the public for three years now. The good-hearted woman said in parts of the countryside, people usually place a water jar in front of their house with a dipper made from coconut shells for passersby to use for quenching their thirst and washing their faces. Understanding the difficulties of immigrants from countryside provinces, she decided to put the vats out with the hope of helping them. She is ready to pour more water even amidst water shortages and her kids are willing to help her or do the duty when she visits her out of town relatives. Ms. Huong said an unknown person donated a drum of water as a signal to keep up the good work. There is also a free water barrel placed at 127 Dien Bien Phu Street of a newspaper shop owner. Refreshment vendor Lam Thi Thanh Bach is not worried that people will cease buying beverages because of the free water tub in front of the shop at Alleyway No.9 of Hoang Van Thu Street in Phu Nhuan district, saying she wants to help ease the burdens of people who have more difficult lives than hers. The more such water casks, the cooler we feel in the hot weather. People tend to become indifferent to everything around them, amidst in the hustle and bustle of big city life, but these casks prove that love remains strong among ordinary citizens.